What if the win is about the journey and not so much about how many destinations you actually hit along the way? Recently I have been chewing on an idea for a future book, or perhaps even a new coach training curriculum topic. I am still in the research stage, but I knew a next step for me was to bounce the idea off a marketing friend and see what he thought. In all honesty I wanted him to love the idea and run with it on his own or with a friend. He hit the ball back and challenged me to follow my dream if it was something I really thought was valuable. That wasn’t really what I hoped for, but it was still a big win for me. I knew my next step was to talk to him. I made a move and followed though. Now I need to make an adjustment and keep moving forward as I feel led. It’s a win! Not because it ended as I had hoped, but because I didn’t let fear or doubt rule my actions. My future is not dependent on his thinking this was a good idea. My future is dependent on my character and tenacity. My success is rooted in an active relationship with God. Success is not hitting every marker on the first try. No one does that. I’m growing in confidence. It feels good. And that is the win. What about you? What’s your next? Are you supposed to partner with someone? 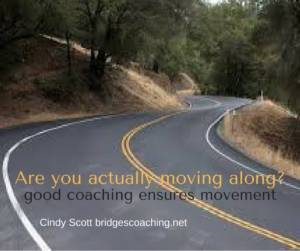 In the Bridges Coaching ROAD – Action Steps in the A. You can move on down your ROAD by following these steps!